Who Offers Automated Forex Trading? Which Forex Companies Allow You to Employ Automated Trading Strategies? One of the biggest benefits of trading in the forex markets is that you can easily employ automated trading strategies. Sure, there are also ways to use an automated strategy in the equities markets as well, however there is one big difference - liquidity. The forex markets are the most liquid in the world, with trillions of dollars exchanging hands every day. Liquidity is a key component in any automated strategy, which is why the forex market is a perfect fit. Now, I am sure that there are many online forex brokers that allow you to utilize an automated trading strategy, however I am just going to talk about the broker that I am familiar with, and that is Forexyard.com. 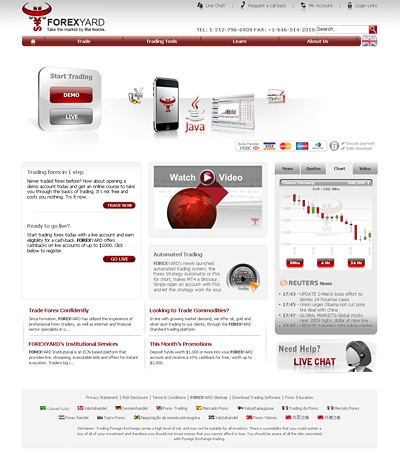 Forexyard offers something called the Forexyard Strategy Automator, or the "FSA". The FSA allows you to pick from a large number of different systems and strategies, as well as being able to create your own. Forexyard users are able to upload their own strategies that others can use. Simply log in to the Forexyard Strategy Automator and you will be able to see all of the different systems, what their methodology is and what kind of returns that they have generated over the past 12 months. The returns have been verified using Forexyard's own signal history over the past 12 months, meaning that there is no room to exaggerate the performance of a system. You will easily be able to see whether or not the system works, as well as how much the system could potentially make for you. Why would people want to share their profitable systems? The forex market is so liquid that there is really no incentive to keep a system to yourself. A handful of small traders employing a forex system, for instance, isn't going to influence the trading in the GBPUSD pair. By openly sharing their systems with the Forexyard community, traders are able to potentially tweak their systems to allow for even more profit. That's win/win. Forexyard is currently offering a cash back bonus of up to $1,000 when you open an account with them. The account opening process is a snap, and you can be up and trading within minutes of signing up for your account. Forexyard also offers demo accounts if you want to give their software a whirl before actually depositing.